"Partners in your time of need"
Donald Joseph Reicherts, 90, of Waterloo, formerly of Dewar, died Tuesday, November 13, at Northcrest Specialty Care from complications of multiple myeloma. He was born July 16, 1928, in Mitchell County, the son of Joseph and Anna Worple Reicherts. He married Lois Marie Schmitt on November 19, 1947, and she preceded him in death on November 11, 2012. 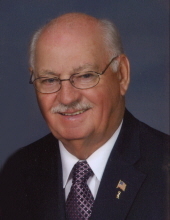 Don graduated from Dunkerton High School and was employed at Construction Machinery and Nobles Manufacturing, which he later purchased and renamed to Don Reicherts Construction. In later years, he enjoyed hobby farming in the Dewar area. Don was a member of St. Edward Catholic Church, where he was a longtime usher. Survivors include: two sons, Gary (Beverly) Reicherts of Osage and Russel (Laurie) Reicherts of Waterloo; a daughter, Kathy (Keith) Blum of Cedar Falls; four grandchildren, Angie Reicherts of Osage, Aaron (Cari) Reicherts and Rick (Katie) Reicherts both of Waterloo, and Kristin (Trent) Tompkins of Cedar Falls; several step grandchildren; six great-grandchildren, William and Carter Tompkins, Danielle and Sydney Reicherts, Joey and Alli Reicherts; two sisters, Vera (Joe) Pfiffner of Waterloo and Bernita Peterson of Dumont; sisters-in-law, Bonnie Wissink of Cedar Falls and Jeanette McMahon of Denver. Preceded in death by: his parents; a brother, LuVerne Reicherts; a sister, Norma Mills; brothers-in-law, Marvin Wissink, Jerry Schmitt, Clarence Schmitt, Bob McMahon, and David Peterson, sister-in-law, Wilma Schmitt; father and mother–in-law, Orville and Harriet Schmitt. In lieu of flowers memorials may be directed to St. Edward Catholic Church or to the Don Reichert’s Memorial fund to be donated to Multiple Myeloma Patient Network to help those in need to pay for myeloma drugs. To send flowers or a remembrance gift to the family of Donald J. Reicherts, please visit our Tribute Store. "Email Address" would like to share the life celebration of Donald J. Reicherts. Click on the "link" to go to share a favorite memory or leave a condolence message for the family.